The star 55 Cancri has been a source of joy and firsts for planet hunters. Not only was it one of the first known stars to host an extrasolar planet, but now the light from one of its five known planets has been detected directly with the Spitzer Space Telescope, the first time a ‘smaller’ exoplanet’s light has been detected directly. Planet “e” is a super-Earth, about twice as big and eight times as massive as Earth. Scientists say that while the planet is not habitable, the detection is a historic step toward the eventual search for signs of life on other planets. The first planet around 55 Cancri was reported in 1997 and 55 Cancri e – the innermost planet in the system — was discovered via radial velocity measurements in 2004. This planet has been studied as much as possible, and astronomers were able to determine its mass and radius. But now, Spitzer has measured how much infrared light comes from the planet itself. The results reveal the planet is likely dark, and its sun-facing side is more than 2,000 Kelvin (1,726 degrees Celsius, 3,140 degrees Fahrenheit), hot enough to melt metal. Lično više volim hladnije vreme. Lakše je zagrejati se nego osloboditi se viška toplote. Teleportation is the extraordinary ability to transfer objects from one location to another without travelling through the intervening space. The idea is not that the physical object is teleported but the information that describes it. This can then be applied to a similar object in a new location which effectively takes on the new identity. And it is by no means science fiction. Physicists have been teleporting photons since 1997 and the technique is now standard in optics laboratories all over the world. The phenomenon that makes this possible is known as quantum entanglement, the deep and mysterious link that occurs when two quantum objects share the same existence and yet are separated in space. Teleportation turns out to be extremely useful. Because teleported information does not travel through the intervening space, it cannot be secretly accessed by an eavesdropper. For that reason, teleportation is the enabling technology behind quantum cryptography, a way of sending information with close-to-perfect secrecy. WHAT IS ET3 and HOW DOES IT WORK?ET3 is literally "Space Travel on Earth". ET3 is silent, low cost, safe, faster than jets, and is electric.Car sized passenger capsules travel in 1.5m (5') diameter tubes on frictionless maglev. Air is permanently removed from the two-way tubes that are built along a travel route. Airlocks at stations allow transfer of capsules without admitting air. Linear electric motors accelerate the capsules, which then coast through the vacuum for the remainder of the trip using no additional power. Most of the energy is regenerated as the capsules slow down. ET3 can provide 50 times more transportation per kWh than electric cars or trains. Speed in initial ET3 systems is 600km/h (370 mph) for in state trips, and will be developed to 6,500 km/h (4,000 mph) for international travel that will allow passenger or cargo travel from New York to Beijing in 2 hours. ET3 is networked like freeways, except the capsules are automatically routed from origin to destination. ]ET3 capsules weigh only 183 kg (400 lbs), yet like an automobile, can carry up to six people or 367 kg (800 lbs) of cargo. Compared to high speed rail, ET3 needs only 1/20th the material to build because the vehicles are so light. With automated passive switching, a pair of ET3 tubes can exceed the capacity of a 32 lane freeway. ET3 can be built for 1/10th the cost of High Speed Rail, or 1/4th the cost of a freeway. ET3 stands for Evacuated Tube Transport Technologies. The company et3.com Inc. is an open consortium of licensees dedicated to global implementation of Evacuated Tube Transport (ETT). A group of students and professors from Yale University have found a fungi in the Amazon rainforest that can degrade and utilize the common plastic polyurethane (PUR). As part of the university’s Rainforest Expedition and Laboratory educational program, designed to engage undergraduate students in discovery-based research, the group searched for plants and cultured the micro-organisms within their tissue.Several active organisms were identified, including two distinct isolates of Pestalotiopsis microspora with the ability to efficiently degrade and utilize PUR as the sole carbon source when grown anaerobically, a unique observation among reported PUR biodegradation activities.Polyurethane is a big part of our mounting waste problem and this is a new possible solution for managing it. The fungi can survive on polyurethane alone and is uniquely able to do so in an oxygen-free environment. The Yale University team has published their findings in the article ‘Biodegradation of Polyester Polyurethane by Endophytic Fungi’ for the Applied and Environmental Microbiology journal. Inside the mouth of every child is a terrifying double row of teeth. Not that you'd ever know it — muscle, skin and bone prevent most of us from ever catching a glimpse of this extra dentition. Here's your chance to get a close-up look at what lies beyond the gum line. On some level, most people probably recognize that a child's erupting permanent teeth have to be situated more or less right on top of their smaller predecessors, in order to dissolve their roots and ultimately replace them (a process known as exfoliation). What many fail to appreciate, however, is just how little room there is for exfoliation to take place. 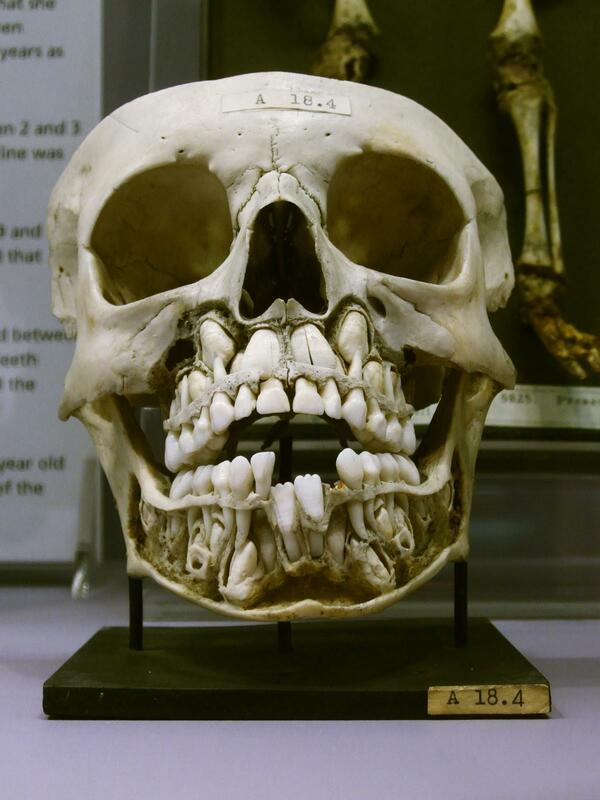 This picture [click for hi-res], taken by photographer Stefan Schäfer at the Hunterian Museum in London, reveals several permanent teeth crammed into a space so small, it almost looks like they're burrowing outward in a bid to escape from the skull entirely — the front teeth via the eye and nasal cavities, the lower teeth by way of the jawline. Stare at it too long, in fact, and the skull's primary teeth almost start to resemble a set of pharyngeal jaws. Wonderful. Now I'll never be able to look at a child again without thinking about xenomorph dentition. Biology: Not only is it fascinating, it's also high-octane nightmare fuel. Fifty years ago today, a coal seam caught fire in Centralia, Pennsylvania, causing the mines beneath the town to catch fire. While the decades-old fire has caused most residents to abandon the town, a few holdouts remain. We mentioned Centralia among our "Underground Fires that Burn for Decades" (along with Uzbekistan's so-called "Door to Hell") and our "Greatest Fossil Fuel Disasters In Human History." It's believed that the Centralia fire started when a group of men set fire to some local refuse located near the opening of an abandoned strip-mine. The fire, which started on May 27th, 1962, spread throughout the city's mines, and with plenty of coal to fuel it, has burned ever since. Lethal levels of carbon monoxide spew from cracks in the Earth. The ground is uncomfortably hot in some places. Because the road buckled and became too expensive to repair, the Centralia branches of Pennsylvania Routes 54 and 61 were permanently closed. Concerned about the safety of the residents, the US Congress bought out most of the city's residents in 1984, and in 1992, Pennsylvania's governor seized the remaining homes under eminent domain, declaring the region condemned. Despite the extreme environment and attempts at eviction, a handful of folks still regard Centralia as home. The 2010 census counted 10 residents in Centralia — which lost its zip code in 1993 — and the locals are attempting to have the government seizure reversed. They claim that the fire poses no threat to their property and pledge to stay put. 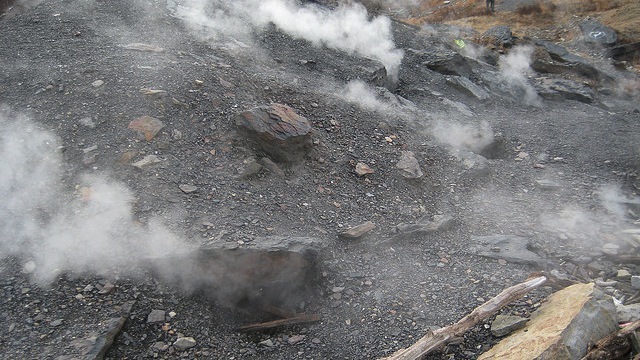 However, Tim Altares, a geologist with the Pennsylvania Department of Environmental Protection, noted that the hazard for Centralia residents is from the toxic gases, and the possibility that eternal flame may open still more pathways to the surface. In the meantime, the swirling smoke billowing from beneath Centralia has provided fodder for a number of spooky fictions, notably the film adaptation of Silent Hill. The one fictional person who could stop the Centralia fire? Superman, who swung by in Action Comics #558 to make a firebreak and rescue the town's atmosphere from toxic smoke. NASA's newest space telescope, an ambitious X-ray observatory, launched into orbit today (June 13) on a mission to peer deep into the universe and study the violent regions around black holes. The Nuclear Spectroscopic Telescope Array (NuSTAR) spacecraft launched spaceward at the tip of an Orbital Sciences Pegasus XL rocket, which itself was carried into launch position by a high-altitude L-1011 "Stargazer" jet aircraft. At 12 p.m. EDT (1600 GMT), the plane dropped the rocket in midair, where the booster fired its engines for its climb into the sky. Mountain View, CA. Today, astronomers have announced new evidence that small planets – the type of worlds most favorable for biology – may be more common than thought. Once believed to accompany only stars with a large helping of heavy elements, this result suggests that – like weeds that can grow anywhere – Earth-size planets can be found around nearly any type of star. The new work bolsters the chances that scientists will eventually succeed in discovering extraterrestrial biology. A team of 29 Danish and American astronomers, led by Lars Buchhave, of the Niels Bohr Institute in Copenhagen, has analyzed data from both NASA’s Kepler space telescope and ground-based observatories to discover that even star systems that contain only sparse amounts of the heavy elements that make up planets can still get enough of this material together to form small worlds, the size of Earth or Mars. This has two consequences in the search for extraterrestrial life: (1) The tally of small worlds is even greater than we once believed, and (2) Even relatively ancient stars, billions of years older than our Sun and generally deficient in such relatively heavy elements as silicon and iron, could host planets that are potential homes to life. This circumstance may help in the discovery of intelligent life beyond Earth. At SETIcon II, a public event being hosted by the SETI Institute, leading experts on planetary systems will be discussing where life might be discovered and how we could find it. Among them will be planet-hunters extraordinaire Geoff Marcy, of the University of California, Deborah Fischer, of Yale University, and Jon Jenkins and Doug Caldwell of the SETI Institute. SETIcon takes place June 22 – 24 at the Hyatt Santa Clara hotel in the heart of California’s Silicon Valley, and will feature approximately 50 panel discussions, fireside chats, and lightning talks. Eminent guests from the worlds of science and science-fiction will be presenting at this unique event. For more information and registration, go to: seticon.org. This latest discovery about so-called exoplanets adds to the growing evidence that planets are commonplace, but also that the smaller sorts of rocky worlds that could have both oceans and atmospheres are similarly ubiquitous. Matematičko rešenje: 1 milion. Praktično rešenje: dvoje, samo treba dobro da paze. Trebalo bi imati i desetak hiberniranih odraslih, čisto da ima neko stariji ako početni odrasli zbog nečeg zglajznu. dvoje, samo treba dobro da paze. Pa reče lepo bez bolesti. uvek mi se nekako cinilo da tehnofobicni sentimenti nekako budu veci podstrek za zanrovsku raspojasanost negoli oni tehnofilicni. Pa da im pomognemo, naravno: obilje IVF zamrznutih fetusa poštedelo bi ih krajnje neugodne situacije "parenja po dužnosti" a kompjuterski operisani inkubatori poštedeli bi kolonistkinje tmurne sudbine "mašina za rađanje". Benefiti su, valjda, očigledni. E sad, ako se ispostavi da će se tu usput ubaciti i neka pomalo eugenički nastrojena genetska poboljšanja... pa, ne vidim što bi se zbog toga ovde sad šokirali, ljudima je to ionako vazda bilo u prirodi. Ko normalan voli da mu se dinastička krvna loza optereti genima dubioznog kvaliteta? Niko. Razlika je jedino u tome što poboljšanje vrste u ostatku životinjskog sveta priroda nameće kroz evoluciju, dok čovek uzima sebi pravo i mogućnost da sam po sebi prčka, vođen intelektom i estetikom. Neke žene se traumiraju rađanjem i kad posle prvog-drugog pomisle da treba tako još 20-30 puta mine ih želja za još dece. Kad ti mašina isporuči dete nekako ti dođe lakše. E zato što oftopičariš ti ćeš za kaznu da čuvaš svu tu decu dok one "šopuju" u sred bestragije. Ali nije ni praktično da ti je pola radne snage stalno trudno. Više jedu, a manje rade (karikiram sad, nadam se da neće neko sad da se peca na ovo). Ne svodi se naseljavanje nove teritorije samo na štancovanje, neko mora i da ore, seje, žanje, muze, melje, kuva, plete... Ranije su se deca i rađala da bi pomagala oko kuće, jer dvoje ne može sve samo. Ne svodi se naseljavanje nove teritorije samo na štancovanje, neko mora i da ore, seje, žanje, muze, melje, kuva, plete... Ranije su se deca i rađala da bi pomagala oko kuće, jer dvoje ne može sve samo. Sutra će sve to roboti da rade, naseljenici samo moraju da obezbede dovoljno inženjera za popravljanje robota. Nego, po našem intraterestrijalnom iskustvu sa kolonizacijom, neće ići strogo probrani genetski zdravi idealisti, nego prvo avanturisti a onda sirotinja i eventualno kažnjenici. Nemojte mnogo da se nadate eugenetskoj utopiji. Zamislite tek kakvi će to poligoni biti za ispitivanje procesa nastajanja novhi dijalekata! Mac to malko karikira, ali u principu mislim da je skroz u pravu kad pretpostavlja da će svaki pojedini kolonista biti isuviše dragocen da bi se akao na mundane poslove. (Ne mislim time da su svi poslovi oko podmlatka mundani, ali dosta njih jeste, pogotovo u toj konkretno fazi dok se oko deteta malo šta radi sem hranjenja i menjanja pelena.) Tačno je to za robote, ali... robot valja onoliko koliko mu je valjao programer a teško je programirati robota za nepoznate uslove. Ima ona caka sa ruskom sondom za koju se očekivalo da će analizirati sastav tla na Veneri i koja nikada nije poslala tu informaciju, iako je preživela dovoljno dugo da tu analizu obavi. Kasnije se ustanovilo da je za to najverovatnije kriv poklopac koji je pokrivao ležište za bušilicu, tako što je pao tačno na mesto na kom je bušilica trebalo da rije tlo. I eto, fenomenalno skup komad mašinerije nije uradio ama baš ništa korisno, samo zato što u blizini nije bilo čoveka da šutne to parče metala... a zamislimo samo sve druge nepredviđene situacije za koje je mašineriju gotovo nemoguće programirati na neviđeno. Ne, ne, ljudska sposobnost opažanja i odlučivanja biti će tu presudna, pogotovo u tom prvom talasu. A posle toga, prva tura kolonista biti će još više dragocena zbog svog specifičnog znanja: lako je decu napraviti ali je malo teže obrazovati ih da prežive u surovom okolišu, a ko bi im to obrazovanje mogao dati negoli upravo ta prva tura kolonista. Naravno, pod uslovom da prežive dovoljno dugo da svoje iskustvo prenesu prvoj generaciji rođenih u koloniji. Za eugeniku nekako ne sumnjam da će je biti, mada pre u distopičnoj nego utopijskoj varijanti. Nešto od toga bi svakako bilo pozitivno, pošto čovek mora da se prilagodi svom okolišu a u ovakvim uslovima baš i ne bi bilo vremena da se čeka na prirodnu evoluciju. S druge strane, znajući kakvi smo sada, opsednuti rasom i nacijom, onaj ko bude najviše finansirao ekspediciju, garant će iznaći masu otvorenih i prikrivenih načina da na njoj ostavi upravo takav svoj pečat. A možda samo umišljam, smoždena svežim utiskom na najbezvezniji sf film kog sam u životu videla - Prometej. Broj opcija daleko prevazilazi kapacitete mašte kojima mi raspolažemo. Kad bi neko odabrao uslove na planeti koja se naseljava, mogući obim i ritam ekspedicija, kao i potencijalna očekivanja od poduhvata, moglo bi se započeti sa igrom kako će to izgledati. Mislim da još niko nije šutnuo poklopac bušilice. Istina je to za broj opcija, a i za potencijalna očekivanja od poduhvata. S obzirom na brzinu kojom uništavamo ovu planetu, moguće je da će nam vrlo skoro trebati nova. Recimo da se nadam da će kolonija imati za cilj da stvori alternativnu Zemlju, sa kojom bi postupala nešto bolje nego sa ovom, poučena iskustvom da je sasvim lako upropastiti i čitavu planetu ako se o njoj razmišlja kao o sopstvenom vlasništvu, a ne samo pozajmljenom od budućih generacija. s tim što je ovo čista utopija imajući u vidu da dilujemo sa homo sapiens sapiensom na ovom nivou evolucije. znači, prvo bi trebalo da se desi neki nuklearni šit na zemlji koji bi mutaciju gurnuo ka "empatičnijoj & samosvesnijoj" varijanti čoveka, pa tek onda bi takvog trebalo otisnuti negde. Ljudi su zaboravna i subjektivna bića. Prvi talas kolonista bi se još i vodio iskustvom sa Zemlje, ali već druga generacija ne bi ni imala ta iskustva, nego samo priče starijih. Treća generacija bi već totalno radila po svome, i dobrano radila na dovođenju ekosistema do ivice održivosti. I tragala za sledećom planetom. Mac, previše brzo prolaziš sa svojom šemom. Dogovorite se oko startnih uslova. Eto, vidis sad kako si ovom izjavom otkrila stav koji negujes u dubuni duse... tebi je svaka iskra optimizma, ma kako malecka, ravna utopiji. A posle ja budem rezident mizantrop. Opet se priklanjam Macovom stavu kad tvrdi da bi kolonisti relativno brzo raskinuli veze sa nasim mentalitetom. Mi smo tradicionalno i istorijski uslovljeni da ovako reagujemo na nas okolis a kad bi se taj okolis drasticno promenio, sledila bi i jednako drasticna kolonisticka adaptacija na novi. E sad, da li bi to bila trajna promena na bolje... to ne mozemo znati, mozemo samo spekulisati. Moja koleginica, inace fanatik nutricionizma, sumira celu tu filozofiju u vrlo prost zakljucak: sve ono ultra ukusno sto jedes, sve to apsolutno nije zdravo ni dobro po tebe. Sta to znaci, da smo genetski uslovljeni na lagano samounistenje? Ako je tako, onda cemo i u kolonijama da uprskamo stvar. Ali, ako nije, mozda cemo da tamo dokazemo da na greskama ucimo. Isto tako, verujem da ce nam i tu pomoci ogromna sujeta, koja je sigurno los gospodar ali je zato vrlo koristan sluga: mozda lansiramo kolonije i pre totalnog ukakavanja ove zemlje, prosto da krajnje sujetno dokazemo sebi i drugima da nam se moze. Ja mislim da situacija sa kolonistima na novoj planeti ne bi bili suštinski razlićita od kolonista na drugom kontinentu. Dakle, pod uslovom da Zemlja još uvek postoji, odnosno da celokupna civilizacija nije nekim čudom uništena, mogli bismo očekivati da odnos između Zemlje i nove planete bude vrlo sličan onome između Britanije i Amerike, odnosno Australije. Hoću reći, ne mislim da okoliš ima tu mnogo veze. Čovek je čovek, ma gde ga posadili. Kultura, braćo, kultura, a ne flora i fauna. Sa obzirom na trenutno stanje svemirskog programa, i sama ideja o kolonijama je utopistička. - da li se održava kontinuirana veza sa maticom? - da li postoji težnja ka osamostaljivanju od iste? - da li je cilj samo eksploatacija bogatstava ili trajno naseljavanje? - da li su prirodni uslovi čovekoljubivi ili ne (atmosfera, klima)? - kakav je domaći živi svet? - da li postoji inteligentna živa vrsta/vrste? Jest, prvi Kinez u svemiru 2003. godine, evo sad prva Kineskinja, a 2020. planiraju svemirsku stanicu. Ja ne vidim što 2050. ne bi imali koloniju. I stargate kod Šangaja. Pa, čim neko naseli prve koloniste i kompletira adresu, evo ti njih. Pa, Amerika nije autsorsovala samo Detroit u Kinu, već je to učinila i sa svojim svemirskim programom. Hm. Cisto zezancije radi, pogledaj kakvo je "stanje svemirskog programa" bilo deset godina pre onog famoznog Kenedijevog obecanja o sletanju na Mesec, pa ga uporedi sa stanjem deset godina nakon te izjave. I pri tom, ne zaboravi da se radi o ondasnjem tehnoloskom nivou, ne danasnjem. Motivacija je cudo, ne smes to potcenjivati, a ako se na to doda fakt da ljudi jesu povodljivi i da je sa njima lako manipulisati, potreban je samo jedan malecki napor maste da se toj manipulaciji dadne pozitivan predznak, za razliku od tog uporno negativnog sa kojim smo toliko srasli. I bila to utopija ili ne, fakt ostaje da je u domenu moguceg. - kontinuirana veza sa mativcom se, naravno, ne odrzava, a ako se i odrzava - beskorisna je. - naravno, ovakve vrste kolonija bi po pravilu bile samostalne, samopodrazumno i sporazumno, bez ikakve borbe. - neka vrst eksploatacije je moguca ali ne i nuzna niti znacajna, trajno naseljavanje je prioritet. - prirodni uslovi su krajnje negostoljubivi - kakva bre Australija, bog budi s tobom, momak, i kakva bre Afrika! - i originalni kolonisti mogu da opstanu samo u autonomnom ekosistemu, bio to skafander ili kupola ili stalivec. Planeti tek sledi teraformiranje, pobogu, ne govorimo o paralelnoj zemlji koju nam je neki Savaot namenio, a ako atmosfere i ima, onda je najverovatnije opasna po zivot originalnih kolonista, mada se genetskom manipulacijom to moze donekle i promeniti kod potonjih generacija. - domace flore i faune nema, ili, ako ste bas toliko krvolocno raspolozeni, ima je upravo takve da pozelite da je nema. - nista nije inteligentno osim ljudi. Slažem se i izvinjavam ako sam ja išta poremetio. Topik je jasno postavljen i oni koji bi se samo zezali, mogi bi da pročitaju naslov. Radi se o SF ekspediciji. Aman, bre, Skalope, ne da nisi nista poremetio nego skroz naprotiv, zezamo se. Opusti se malo, svoji smo na svome. PS. zamisli kolonije tipa one iz Gospodara svetlosti... ah!! Ma, jedno je SF ekspedicija, a drugo ekspedicija naseljavanja u svemiru. Ono prvo mora imati distopični karakter inače je dosadno. Recimo, pisac tvrdog, ABNovskog SF-a mora znati iz kojih u koje uslove ide, koja je motivacija (da li je frka ili plan), u kojoj fazi se društvo na Zemlji nalazi... itd... itd... Dakle, zamisliš polazne uslove i pakovanje kreće. Sasvim je svejedno koja je tehnika putovanja, važno je da se stiže. Naravno, trolovaćemo sami svoju priču, ali jednom rečenicom, da se može odgovoriti. Da stvarno, ko bi bacao pare za nešto što mu neće povratiti investiciju? Ponajpre fundamentalisti, uglavnom religiozni. Samo, odakle njima pare? Руку на срце, ова тачка је прва и најважнија. Ако докучимо ово, остало ће лако кренути даље. Зашто? Па оно што се ја упљувах, рецимо, кад се прича о приступању ЕУ: хајде да видимо cost/benefit анализу. Тачка 2 је ту занимљива и често се у неко наивније време насељавање других планета видело као решење пренасељености. Прц! - кажем ја. Цена транспорта великог броја људи на другу планету толико је већи од уништења истог броја људи да о тој варијанти једноставно не треба ни размишљати. Ако то одбацимо, практично остаје само ово прво јер би (у почетку бар) земаљска експлоатација ресурса те друге планете била приоритет. Опет је нејасно да ли би се то исплатило или се пре тога више исплати експлоатација астероида, рецимо. Баш сам недавно читао о прорачунима тога да ли се исплати хватати и мања тела и допремати их на Земљу, уз наравно строгу процену њиховог састава. Дакле, колонија на другој планети само колоније ради може бити еквивалент истраживачких станица на Антарктику или свемиру. Ко има лове плати да неко тамо проводи више времена, али се опет поставља питање да ли је људска посада толико потребна или се исплативије слати сонде. Експлоатација је УВЕК кључна реч и само о томе вреди разговарати. Све остало су маштарије. Džone, volim ja tvoj tvrdi način razmišljanja, ali eksploatacija je tek na trećem mestu. Prvi i ultimativni motiv je tanatos. U ovom trenutku se razmatra bar deset uzroka globalne katastrofe. Kad Branson, ili ko već, uloži stotine miliona dolara u fol komercijalno putovanje do orbite nad Zemljom, on ulaže u polaznu stanicu. Odatle će već nekako da zbriše. Seti se kako su u Sajgonu gubitnici visili na helikopterima kad je vrag odneo šalu. Znači, survival je na prvom mestu. Ne smem da kažem da je eros na drugom, neko će mi se smejati.